Making a wire wrapped bead chain is satisfying and enjoyable. The completed chain is very versatile and can be used for bracelets, necklaces, earrings, to make tassels or as a component in a design like this hand chain bracelet. 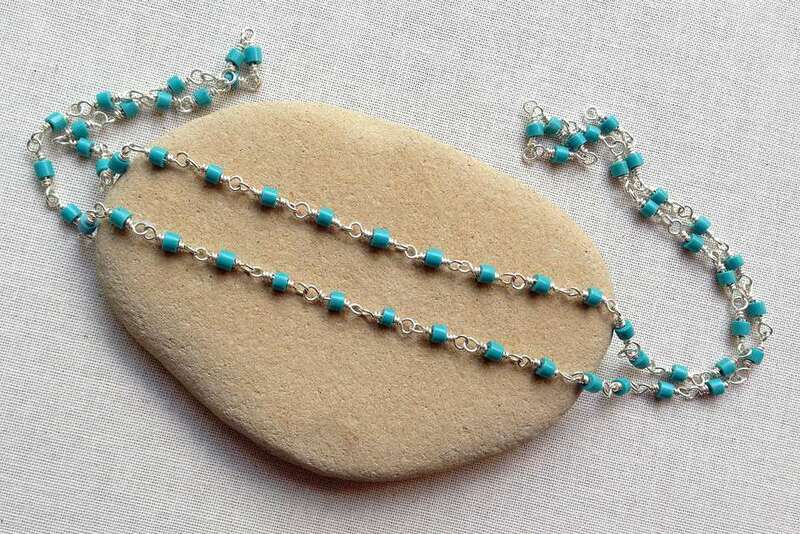 Bead chain is made by creating and linking beads surrounded on either side with wire wrapped loops. Once you have learned the basic technique, you may wish that you could make the process go more quickly, with less time spent constantly switching tools. This step by step will show you how to make a bead chain more quickly by using an assembly line methodology. The key to an assembly line process is to repeat each step a number of times before moving on to the next step in the process. The reason an assembly line process is quicker is because you make the most of using the same tool or process before moving on to using the next tool or process. It saves you the time you would ordinarily be looking for and switching tools and materials. To make bead chain in this manner, you will first cut all the wire, make the open wire loops, make the first wrap, add the beads, make the second loops, connect the components and close the loops. In order to cut the wire for each link in advance, you need to know how much wire is used for each link. Before you make the first link, cut a piece of wire that you know is longer than you need. In this case, 2 inches of 24 g wire. After you make the wire wrapped link trim the extra wire on each side and save and measure the excess. In this case, the extra is just under 1 inch. So now we know each link takes just over 1 inch of wire. But remember, you can't actually cut the amount of wire you need. There needs to be a little extra to account for variation in the size of the beads and loops, plus you need a little extra to grab onto and make your wraps. Since this wire can get marred and flattened by your pliers, it's always best to plan to trim a little on every wrap. For each of these wire bead links, we cut 1.5 inches of wire. Before you cut a lot of wire that size, make sure that it is the right length by making a few links with that size piece of wire. Once you make adjustments and find the right size, just line up a piece cut to the right size with the wire on the spool, and cut, line up again and cut, line up again and cut, etc. After you have cut the wire for each bead link, you are going to make the loop for each link. The quick method for making bead chain uses each tool to finish as many links as possible before putting down that tool and moving on to others. In this case, you will use your round nose pliers to make all of the loops for the links. Wrap the loop for each bead link using one pair of pliers to hold the eye of the loop and another to grasp the wire end and wrap it around the neck. We recommend using flat nose pliers, chain nose pliers, or bent nose pliers. In general, it is best to use pliers with smooth jaws so the wire doesn't get marred while you are holding it and wrapping. Repeat until you have finished all links. Make another loop above the bead using your round nose pliers. Make sure you leave the loop open so you can connect them to the other chain links. Repeat with all links. Slide the open link into a closed link and then wrap the second loop. You can choose to add all the links and then close them as you see in the picture or add them one at a time. If it's your first time doing this method it can be easier to do them one at a time. However, we do find it easier to connect them all and then make the wraps. You can trim the wire tails as a final step—although you could trim the tails after making each wrap. The reason we recommend to wait is just in case your second wire wrap ends up a little short, you can compensate by adjusting the first wrap as long as you haven't trimmed the tail of the first wrap yet. This will allow you to have your loops snugged close to the bead so it doesn't slide around on any extra wire. How much quicker is it to make your bead chain this way? It really depends on how familiar you are with each step. This method also allows you to do the steps while you're doing something else, like watching TV. Doing the same step takes less concentration than making an entire link.